Art Dubai is marking its 13th edition with an exhibition running March 20 through March 23. 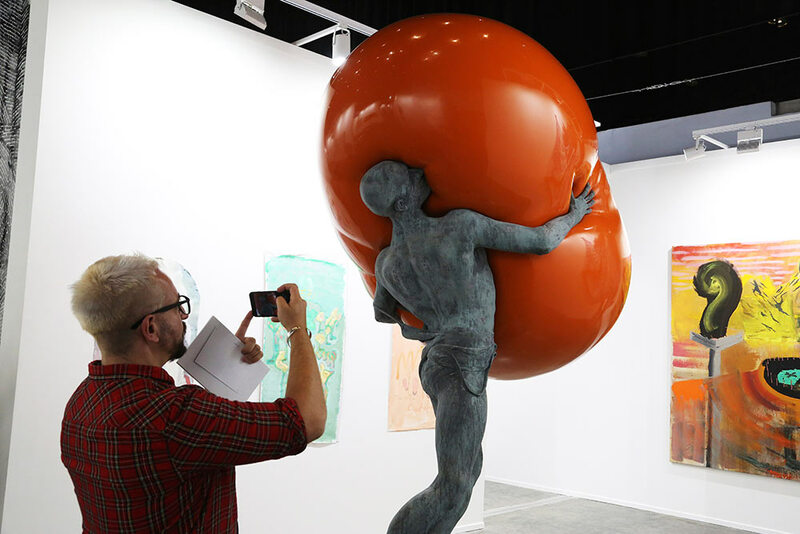 A man takes a photo of Iranian artist Mohammad Hossein Gholamzadeh's 2019 work "Farewell to Proserpina" at Art Dubai in Dubai, United Arab Emirates. Art Dubai is marking its 13th edition with an exhibition running March 20 through March 23. 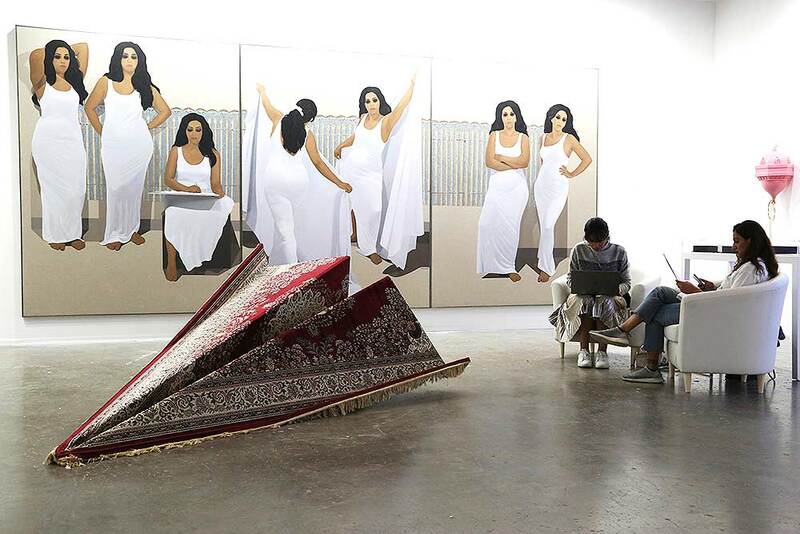 Women sit in front of Egyptian artist Ibrahim el-Dessouki's 2019 painting "The Seventh Day" and near Lebanese artist Ali Chaaban's 2019 Persian carpet work called "12:00 p.m. Class" at Art Dubai in Dubai, United Arab Emirates. 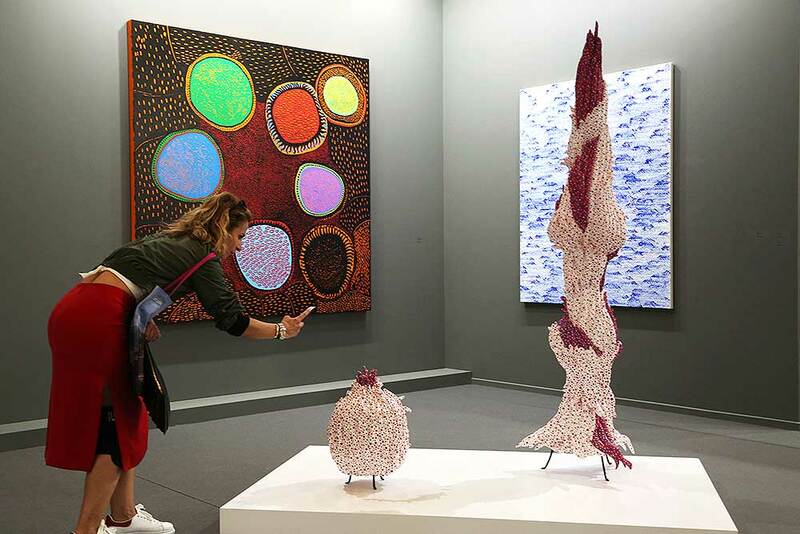 A woman takes a photo of Japanese artist Yayoi Kusama's 2018 piece "Flower" at Arab Dubai in Dubai, United Arab Emirates. 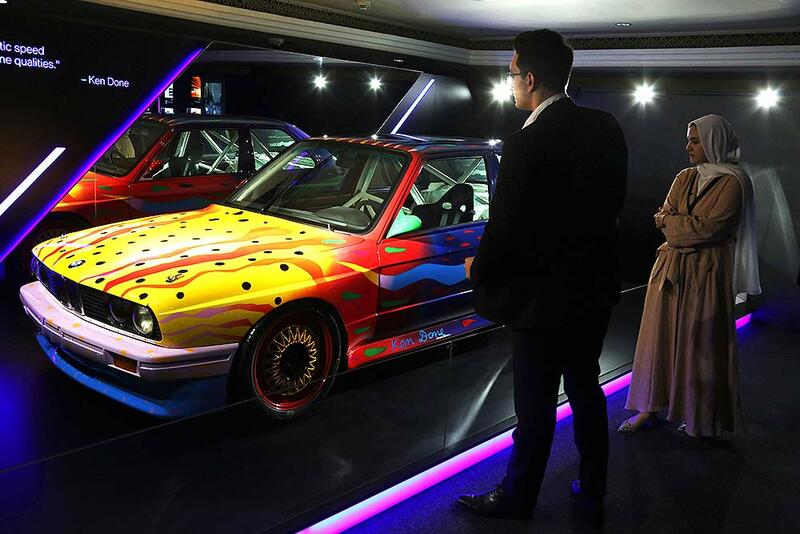 A woman looks over Australian artist Ken Done's art on a 1989 BMW M3 at Art Dubai in Dubai, United Arab Emirates. 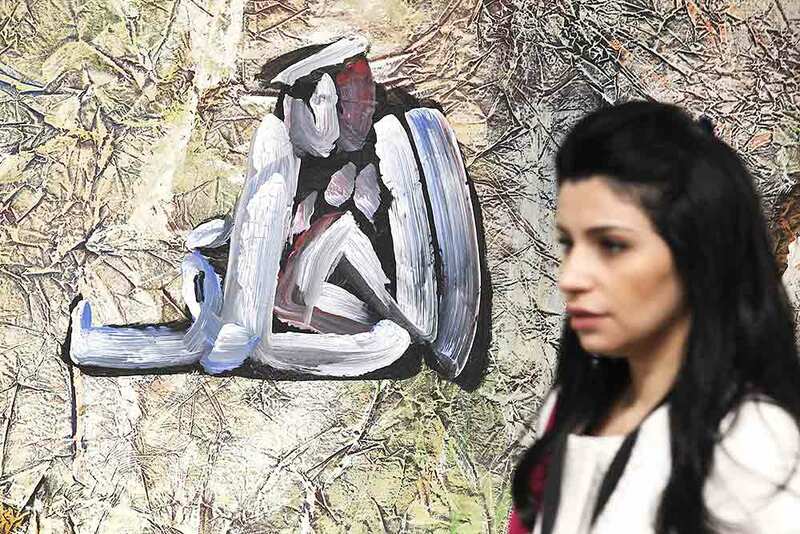 An Emirati woman sits in front of Syrian artist Manaf Halbouni's 2015 work "Secret Service ... Mukabarat" at Art Dubai in Dubai, United Arab Emirates. 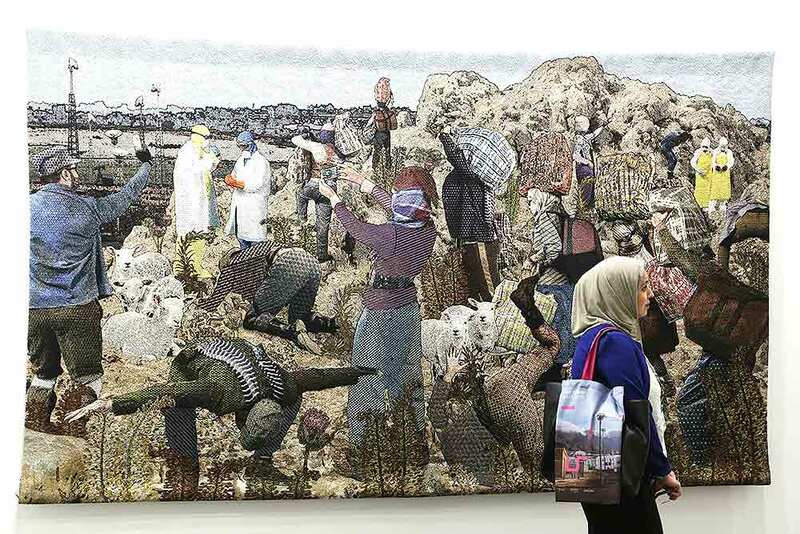 A woman walks past a 2017 work made of cotton and wool by artists Anthony Aziz and Samuel Cucher called "The Road" at Art Dubai in Dubai, United Arab Emirates. 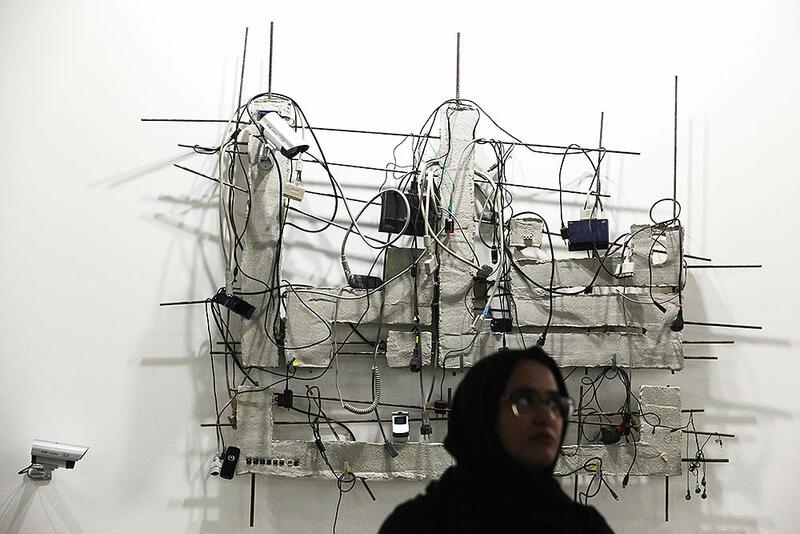 A woman walks past Egyptian artist Hamed Abdalla's 1978 work "Coma" at Art Dubai in Dubai, United Arab Emirates. 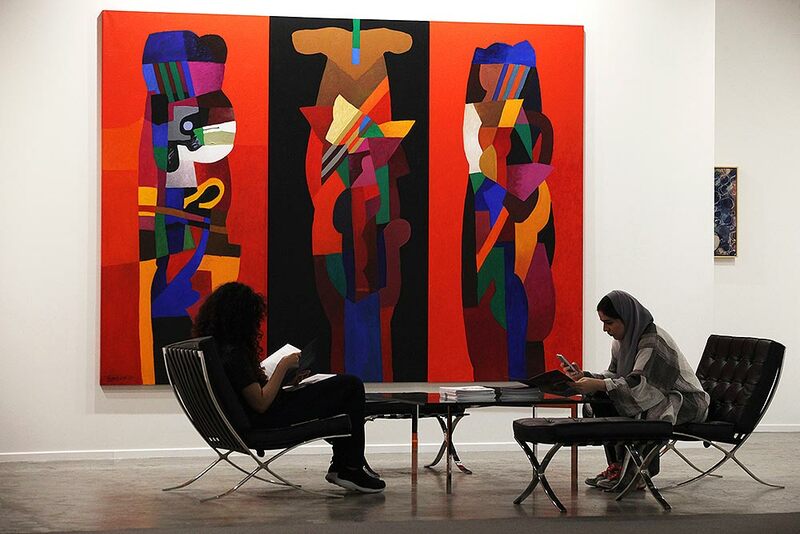 Women read through pamphlets in front of Iraqi artist Dia Azzawi's 2016-2017 work "Three Obelisks" at Art Dubai in Dubai, United Arab Emirates. 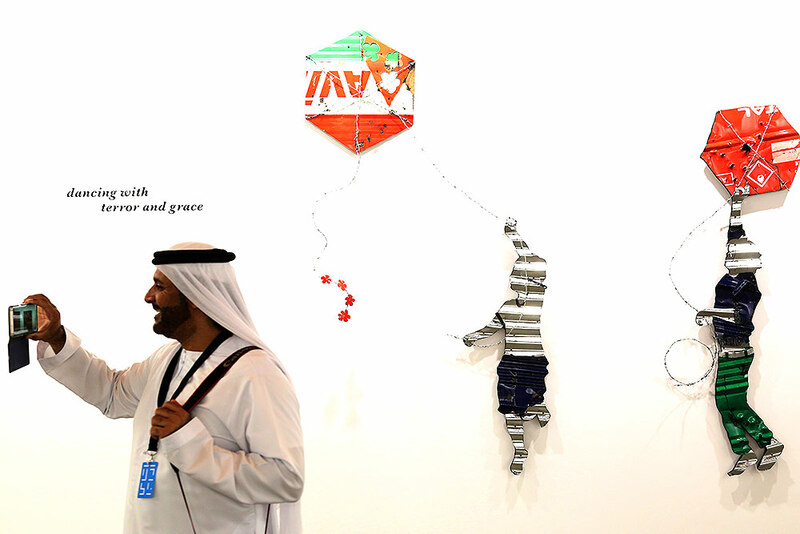 An Emirati man takes a photograph with his mobile phone in front of Lebanese artist Abdul Rahman Katanani's 2018 work "Gaza" at Art Dubai in Dubai, United Arab Emirates. 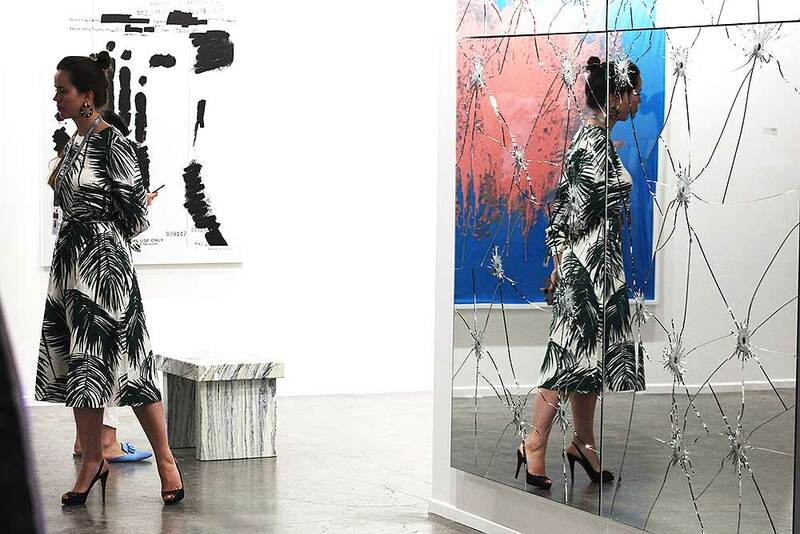 A woman is reflected in the broken glass of German artist Astrid Klein's 1993 untitled work at Art Dubai in Dubai, United Arab Emirates. 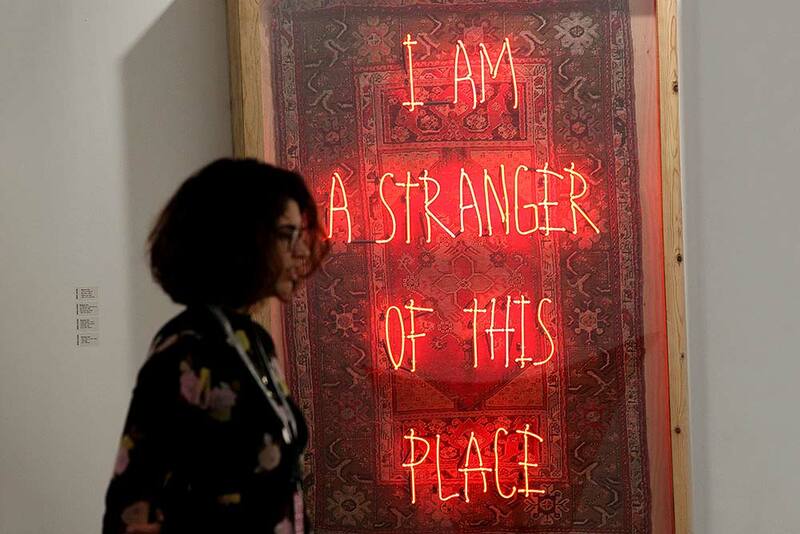 A woman stands near Turkish artist Ramazan Can's 2018 work "I am a Stranger of This Place" at Art Dubai in Dubai, United Arab Emirates. 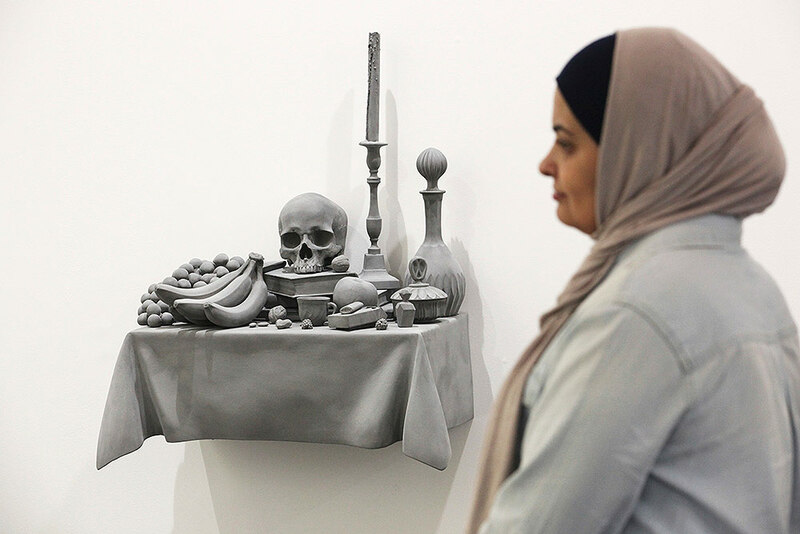 A woman walks past Belgian artist Hans Op de Beeck's 2018 work "Vanitas (Variation)" at Art Dubai in Dubai, United Arab Emirates. 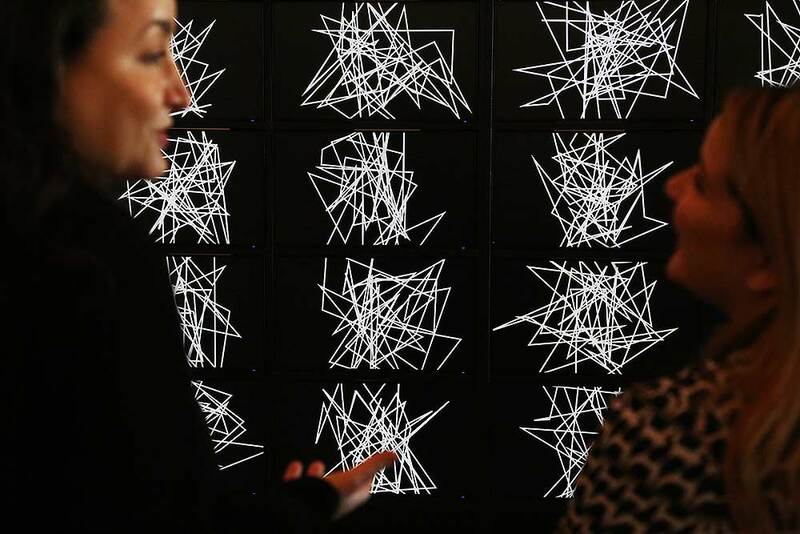 Two women talk in front of Saudi-born artist Daniah al-Saleh's 2019 audio-visual work titled "Sawtam" at Art Dubai in Dubai, United Arab Emirates.